Therefore in Andhra Pradesh, the voters can search for their name in the voters’ list and receive their voter id details entirely by using their mobile devices. Also Read: How is the Chief Election Commissioner of India appointed? How to use the mobile device to complete these two tasks? To receive your Voter ID Details you need not have android operating system on your mobile phone because these details can be obtained by the voters in Andhra Pradesh, simply by sending a text message. To receive these details, you have to type ‘Vote <Voter ID Card Number>’ For example, if your Voter ID Card Number is AP123456789101 , then you will have to text ‘Vote AP123456789101’ and send it to 9246280027. Henceforth you would receive a text message with your Elector and Polling station details as a reply. Also Read: How to Apply for Voter ID Online Transposition? This mobile app is surely another feather in the cap of the Election Commission that seeks out numerous ways to incorporate the latest technology into the prevalent Voter ID Card application process and hence make various tasks easier. We hope that an application like this soon available for all the States of India. How to check Voter ID details through SMS in Delhi? Similarly for Voter ID Card Delhi, you can check your details or name in the voters’ list simply by texting ‘EPIC(Space)<Voter ID Card Number> and sending it to 7738299899. Just like the internet, the incorporation of the mobile systems into the Voter ID Card process would surely be a success and hence take the Election Commission one step forward in realizing its dream of achieving 100 percent voter turnout in the elections, hence catalyzing the working of this great democracy of ours. i was an applied at new oter id in online.. that’s status will be success but, I could not get any oter id or epic number..
an error in address of my voter card. please rectify. Kya mega voter I’d card valid he? Sir I applied for correction of voter card on 18th April 2015 through form 8 .you have given a referance number as F8-1606463. Till now not corrected.please send corrected voter card .Thank you. We haven’t given any reference number, it is the election officers handling the voter id card procedure who must have given. We do not issue nor make voter cards. We guide and help people in the process and steps involved clear their queries. i want the reason why? Please check the status following once again. If still you do not find any statue, then you will have to contact your local polling office to knw the reason. At times if the application is not properly submitted or some documents are missing etc, then they are not processed. I have registered my name through online for voter ID card Ref. tracking no. ID no. 1511899373328f27 please let me know the status for this ID card. Please follow the steps mentioned in this post to check your status. Nobody can do it for you, you yourself will have to check the status. I WANT TO KNOW THE STATUS OF VOTER ID NO. AND WHETHER ISSUED OR NOT. sir my epic no is RXC1419910 . I have still not got my voter id card.it has been more than 1 year.Epic no has been provided by the electrol people on enquery which is correct when checked on internet.how to get my voters id card?? I am from lucknow and i have epic no (XGFO871046) unfortunate i got two mistake on my card. first in name & second in add. can i correct that mistake online or any other proses. please guide me. or solve my problem. If you have the wrong spelling of your name on the EPIC, wrongly mentioned address, age or D.O.B, then your card qualifies for correction of details which could be done by filling the Form No. 8. This form is available for download from this link here. and could also be filled online. The procedure of filling both of the forms is similar to the procedure of filling the Form No. 6. Appropriate documents and passport size photographs are also required. Sir ji mera voter id jalde kardu plz…. 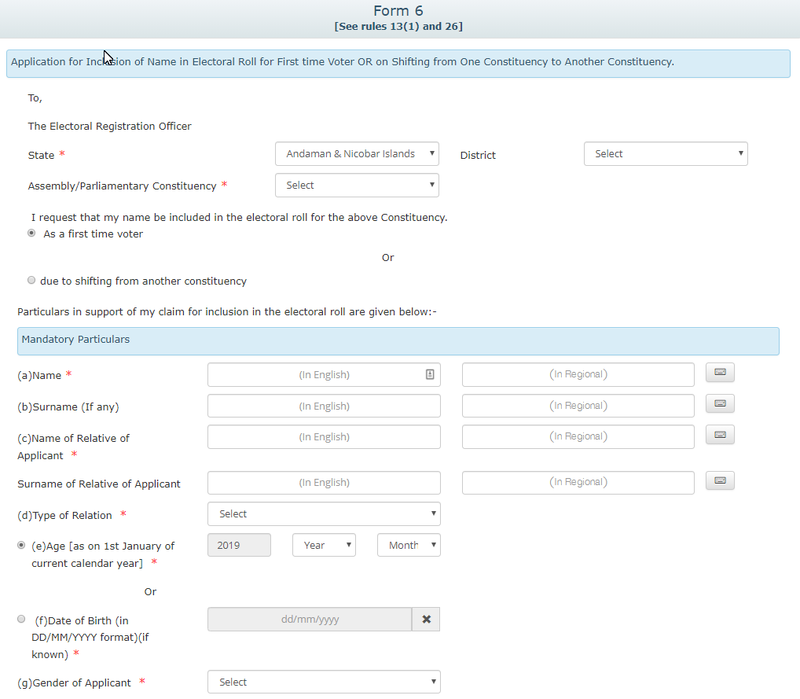 A Comprehensive Step by Step guide about filling Voter Registration Form No. 6.